When it first opened in 1879, the original Eagle Mountain House & Golf Club offered 12 guestrooms, which were modest beginnings for what would be one of New Hampshire’s premier resorts. In 1915, the main historic inn was completely destroyed by fire; however, in less than a year, the Eagle Mountain House was rebuilt and re-opened. 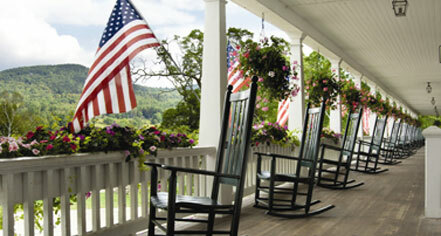 The new inn had expanded to two buildings, boasting a 280-foot veranda and 125 rooms with 100 full baths. In 1931, Arthur Gale, son of the historic inn’s original builders, transformed the farmland and cow pasture in front of the inn into the nine-hole Eagle Mountain House Golf Links and, in 1936, ski-meister Beno Rybizka ran the first organized skiing in Mount Washington Valley on the ninth hole of the course. In 1957, Mr. & Mrs. Orin Chadbourne took over the inn and installed the swimming pool two years later. They owned the inn until April 1973. In 2012, George Heaton, from Heaton Companies, purchased the Eagle Mountain House from the condominimum owners. 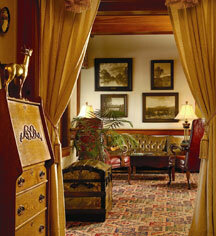 Heaton's goal is to renovate the rooms and public spaces while maintaining the historic nature of the inn. Read more about the history of Eagle Mountain House, as told by Historic Hotels of America 2014 and 2015 Historian of the Year Stanley Turkel. Excerpt is taken from his latest book Built to Last: 100+ Year-Old Hotels East of the Mississippi (AuthorHouse 2013).